Students in the Georgia Southern’s Army Reserve Officers’ Training Course (ROTC) are housed together in the ROTC Theme Community. Members of the community participate in common courses, events, and training. Student are assigned to these spaces by the ROTC program. 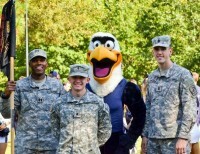 Students must be members of the ROTC program at Georgia Southern University. Students are asked to participate in TC specialty programs, such as teambuilding activities, study breaks, and more. Room Type: Students who live in this community will be placed in a 2- or 4-bedroom apartment unit, which includes a kitchenette, shared living room, and access to the Southern Pine’s clubhouse. Preferred Roommates: Students may list a preferred roommate on their housing application, but roommate must also meet the requirements of the ROTC TC, apply, list their preferred roommate(s), and opt into the experience before students will be roomed together. We suggest that preferred roommates complete their application materials around the same time, as assignment to the community is on a first come, first assigned basis.